Foundation piecing! 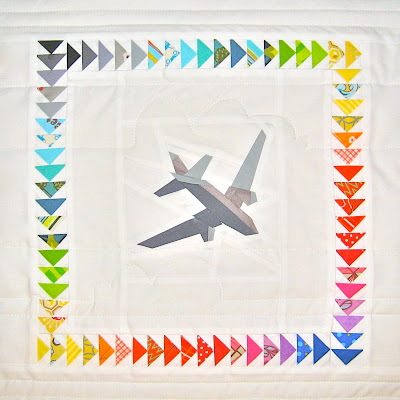 Today, I thought I'd share with you my affection and advice for this quilting method, as it is an easy-peasy way to accomplish complicated designs or recreate blocks with precision. Because it's something I've really been excited about since I started quilting, I thought I'd discuss the pros and cons of the method, some sources for fun patterns and pattern drafting, and a few examples of what a beginner/intermediate sewer can accomplish. Stitch on this side ...flip.... and press this side. A common complaint I've encountered is that it's confusing or difficult to learn. That's simply not true. The only mental hurdle you need to overcome is that your printed foundation pattern (the lines you stitch on top of) is the mirror -image of the block you are creating. Otherwise, it's essentially a paint-by-number work. You add each sequential piece, right sides together, stitch, and then press open. Quilt-As-You-Go is essentially the same method but in a free-style form. There are numerous online tutorials useful to get the hang of it. 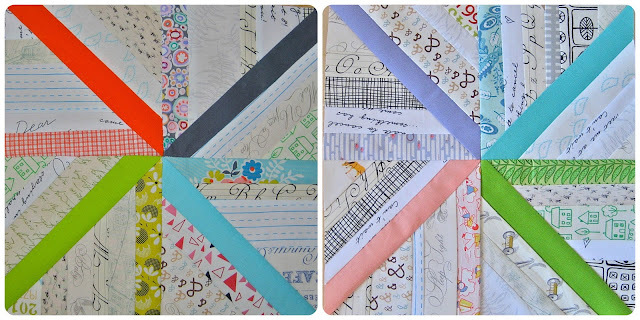 I thought I'd just add some links I've found helpful such as: A super-easy beginner block by Marcia Hohn from Quilter's Cache, a super-organized method for chain piecing multiple blocks by Carol Doak, and a super-laid back and stylish star block by Anna at Six White Horses. There are also many videos on Youtube (like this one) if it helps you to see it in action! My first pattern designs, drawn and stitched on freezer paper. With a little internet encouragement, I quickly learned the ropes and the first foundation-pieced projects I ever made were patterns I drafted myself. If you can sew a straight line, you can foundation piece! Now for the bad news - there are a couple of noticeable downsides to foundation piecing. First off, it's wasteful. It requires more fabric than would be necessary with traditional piecing and you need to factor in the cost of printing or creating your own foundations. Second, it is time-consuming. You might not need to rip many stitches but every stitch line also requires pressing, folding, and trimming. There isn't much way around it so you need to work out a nice routine that's easy on your body for accomplishing the steps (pin, stitch, press, fold, trim, pin, stitch, press, fold, trim....you get the idea) over and over again. 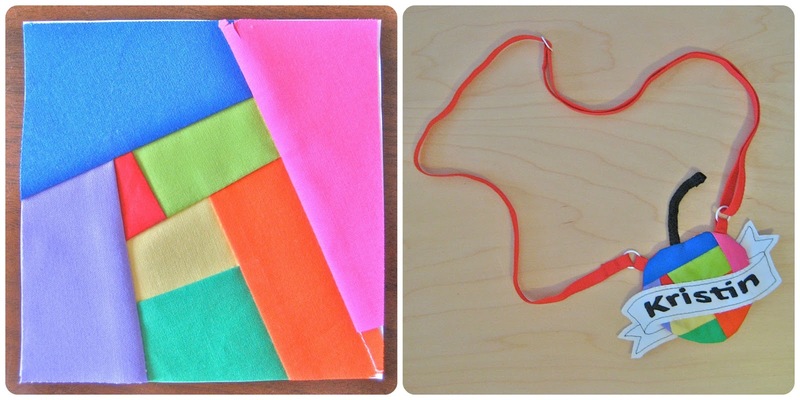 If you are making many blocks, then chain-piecing can really help cut down on the minutes. Finally, don't underestimate the time it takes to rip off all that paper. Unless you stitched to fabric or interfacing, you'll have to remove every bit of the paper foundation. This takes awhile, so get a tasty beverage, put on a good movie or music playlist, and get out your tweezers. Better yet, enlist the help of your family or friends. My tips for making Marcia Hohn's free pattern, Tallahassee, here. I hope I haven't made you apprehensive about the time it takes to paper-piece. 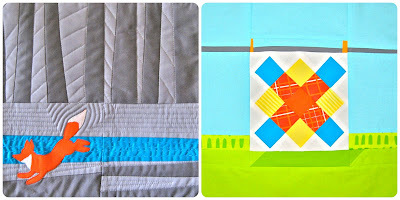 It surprises me that many quilters disdain time-consuming methods. Isn't that a part of the grand tradition? As in: the more intricate the lace crochet, or the rug weaving, or the number of one-inch squares in a postage stamp quilt -- the more valuable the item... right? I humbly beseech you, don't fear the time it takes to make beautiful and complicated foundation blocks. They are worth it! Now, if you already know you love the method or if I haven't scared you off, the next step is finding (or creating!) a great pattern to work with. There are tons of great free patterns to be found on the internet. Pinterest is full of them! The airplane block at the top of the page was a freebie by Paper Panache. And do you remember a famous hedgehog block by Sonja at Artisania? A couple more of my favorite sources are the Block Rock'n Flickr group with a free pattern archive hosted at 627Handworks and the Forest Quilt Along hosted at Shape Moth. Same goes for books. Currently, I'm loving Ayumi Takahashi's book Patchwork, Please! She included several foundation block patterns including this tea cozy as well as open books blocks. (For my Minneapolis readers-) Hennepin County Library has dozens of titles that deal exclusively with foundation or paper-piecing and many are from the last couple of years. Check out Etsy (or Craftsy) or your local quilt shop for other, individual patterns for sale. 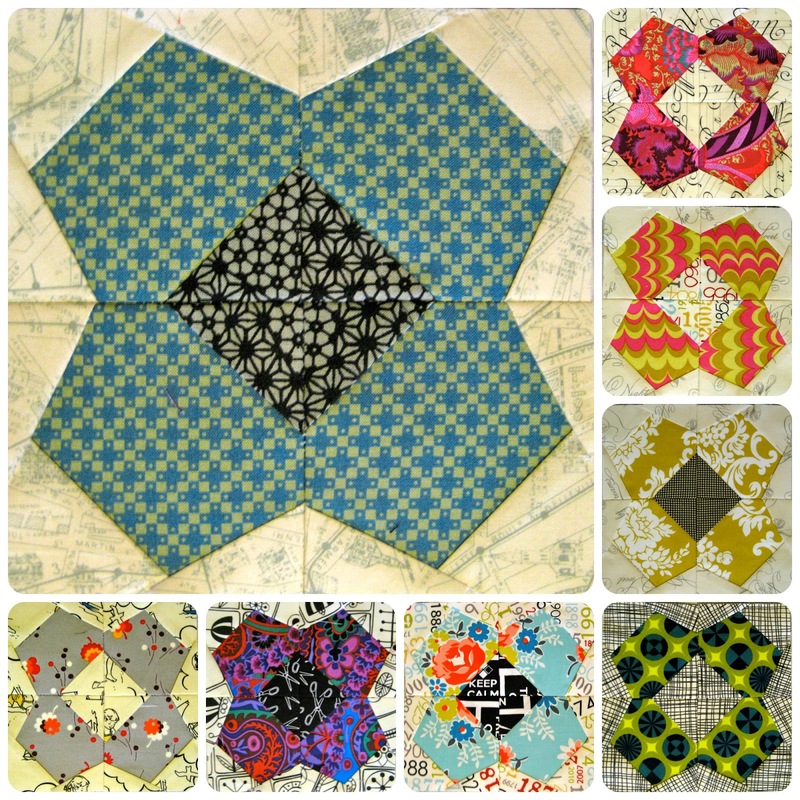 Remember our fabulous June lotto block, Letha's Electric Fan? Well, there are more great patterns by Cherise Creates in her online shops. Another terrific designer is Cyrille at Bubblestitch (she designed the Goldilocks block earlier in this post.) Some more of my favorite patterns are the alphabets by Diane Bohn of From Blank Pages, Carolyn Friedlander's Stripes, Aerial, and Backbone, and there are countless mariner's compass and New York Beauty patterns available with a simple Google search. What's so amazing about foundation piecing is that it makes all of these patterns possible. Precise points, amazing (and minute!) details, and stunning curves...all with one simple technique. Finally, you can always draft your own pattern. It's pretty easy with a ruler and pencil. Besides the mini quilts I've shown above, I've also drawn foundations for existing block designs. These Twirling Asterisks (above) were designed by Janine at Rainbow Hair Quilts in April. In June, for a quilting bee, she granted our group permission to use her block as inspiration but each bee member had to create a base pattern to the same specifications so that the resulting blocks would match up once they reached their recipient. It worked really well! Do you recognize this design from our MplsMQG logo? That's right, it's foundation-pieced. You can also resize any foundation block in order to easily customize it. This school house block is only two inches! If you are interested in pattern-making, I found this tutorial over at Sew,Mama,Sew! extremely helpful and the origami-inspired animal blocks are really cool. 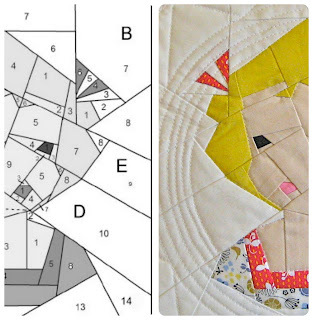 An experienced quilter can make anything into a pattern; check out the vintage swim suit that Diane Bohn turned into a picture-perfect quilt block. The ultimate upside of foundation piecing is the impressive result it makes possible. 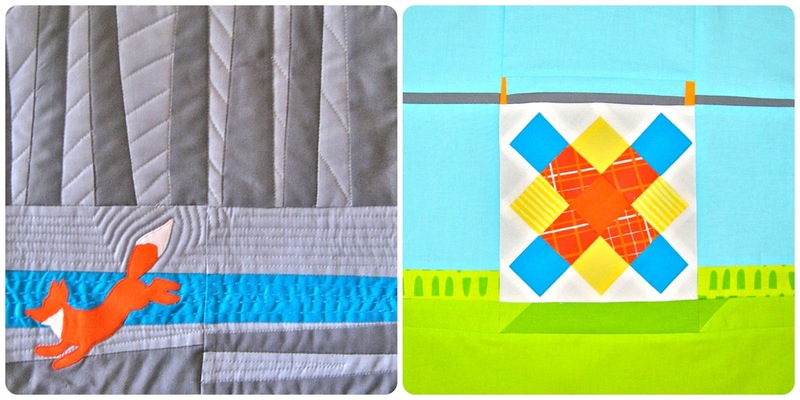 A beginner quilter can stun any audience. (For example: Carolyn Friedlander herself just favorited a foundation pieced pillow sham of mine on Flickr -- I am in shock!! I sew like a child!!!) In any case, I hope that this post will be helpful and that you too will be inspired to stitch some foundation-pieced love to share this summer. Or even better, draft another pattern for us all to enjoy! Great post! I have been wanting to try this but not sure where to start. I signed up for a Dr. Who paper-pieced quilt-along and was immediately overwhelmed. :-) I'll try some of your links and give it a shot! Oh - I hope you do! Just remember to take your time. I did some paper piecing last year. I vowed it to be my last as I struggled to get all my blocks to lie nice and flat and to get my larger pieces to line up correctly. Maybe I was doing something wrong? Either way the quilt turned out fine but it seemed to be a lot more work than it should have been. Like I said I may have been doing it wrong but I did follow several tutorials to a T so I'm not sure why I had such trouble. I think you're right that sometimes they are more work than necessary. But if you find a block pattern you really admire, maybe it will be worth it to try again? For me, I've found that keeping the paper on finished segments helps me join blocks more carefully. I just pin through the corners and any pattern joints and stitch along the seam allowance line; the paper foundation stiffens the block better than starch and the pins keep things accurate. Great post Kristen - all the links are so helpful - this is a great resource! Really great post. I'm inspired to try this again! Thank you Kristin for the inspiration and the links. Can anyone direct me to the pattern for that doll or little girls portrait?